I like to follow along with Project Run and Play. Every once in awhile, I add to the link up. 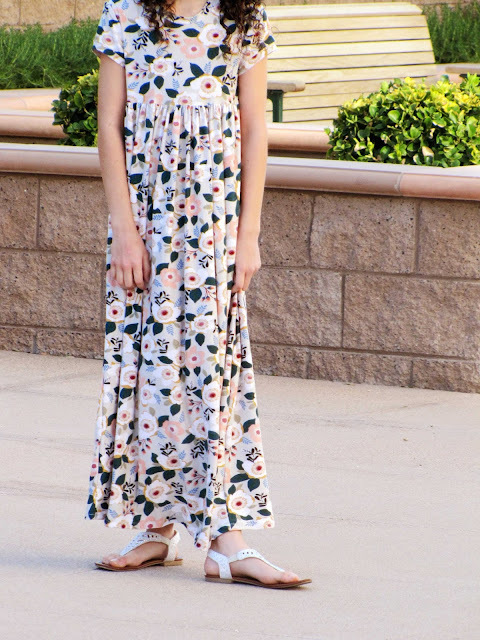 This week's theme, Crafting a Story, worked perfectly with my daughter's Easter Dress. Since Jane Austen is my favorite author, a modern Pride and Prejudice sounds good, right? This is my daughter's Easter dress. It's a soft knit that she absolutely loves! To fit with the Pride and Prejudice theme, it has the empire waist and long length. It's her first maxi dress, but it won't be her last. It makes her feel so grown up! Also, Pride and Prejudice is totally a children's story. See? I love this so much!!! It definitely fits Pride and Prejudice and the fabric is so beautiful!!! I love that fabric so much I used it too! I didn't know it came in knit. I must get some! Cute dress! This is so perfect! We love Pride & Prejudice too. And my daughter loves maxi dresses for the exact same reason! Very pretty! I love big girls in maxi dresses, makes them look and feel so happy and comfortable!